Only one of these hats doesn't belong to me, can you guess which one? Visit all the Photo Hunters, here. Gosh, which one. I will guess the read one at the bottom. Note sure why, just a feeling. The top one on the left? I should check, I'm not quite sure!But it's a great collection!! I will guess the top right does not belong to you. I'm not even going to try to guess. LOL! 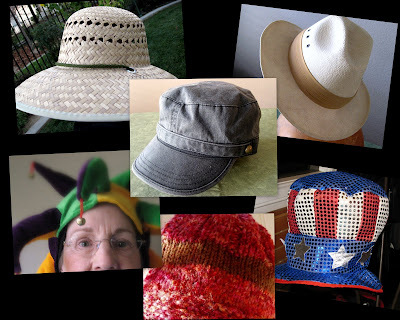 Nice collage of hats. i think the cowboy hat that is on the right. Noner was correct, it's the Uncle Sam hat.